I grew up swimming competitively and worked as a lifeguard throughout my teens. In 1995, when my oldest children were young, I became certified as a Water Safety Instructor (WSI), because it was hard to find quality swim lessons that touched on aquatic safety. Shortly thereafter, I became certified to teach lifeguard courses, CPR/AED, O2 & First Aid. To date, I have taught over 1000 children how to swim, and have coached several local swim teams. I am passionate about teaching children to swim and how to be safe in and around the water, and have come to be known as “The Swim Lady”. 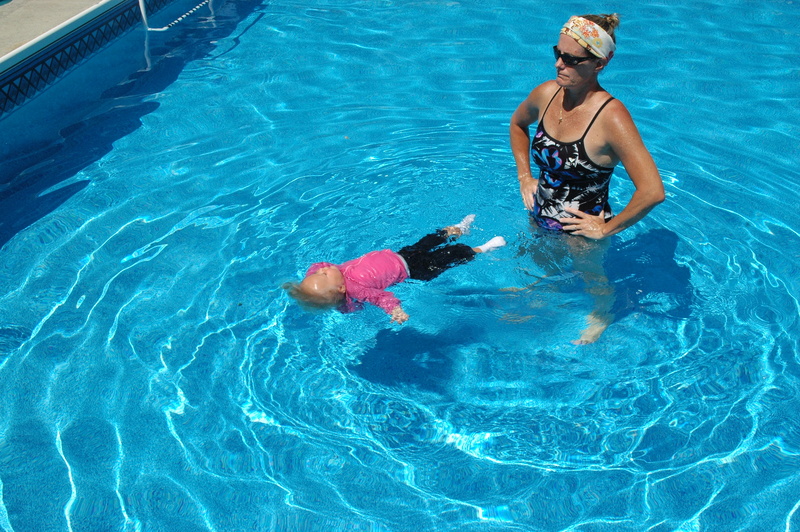 Infant Swimming Resource was introduced to me through a friend in 2006. Upon researching the program, I was fascinated and wanted to be able to provide those incredible skills to my littlest students. It became one of those things that kept pulling at the back of my mind. Late in the summer of 2009, a toddler in my neighborhood tragically drowned, and within a week her family called to ask me to teach their surviving twin to swim. I knew immediately that I had to certify as an ISR instructor, if only to skill that one little boy. My ISR training started in February 2010, and I began to teach the ISR technique on my own that May. I trained with and have taught over 349 children from February 2010-Present. I continue to teach American Red Cross and Infant Swimming Resource lessons and to educate my community about drowning prevention. It is a privilege to help my young ISR students develop confidence and learn the ISR Self-Rescue™ Technique. It is equally rewarding to watch my students aquatic knowledge and skills improve as they move into stroke work taught in the American Red Cross’ Learn To Swim program. I am blessed to teach my students year after year and a few have even continued on to become lifeguards or instructors themselves. My ongoing professional and educational development is in fields such as childhood behaviorism and development, early childhood education and anatomy and physiology through ISR. I have recently been selected into the Master Instructor Training Program and plan to complete my training by the Spring of 2017. I also continue to keep up-to-date with program changes involving my various certifications through the ARC. I live on the Outer Banks of NC with my husband and five children.